With over 1,000 islands , islets and reefs to visit, renting a boat is perhaps the best way to explore the Croatian coastline and to reach those idyllic secluded coves and isolated bays. Many of our villas and apartments now come with private boat mooring or have access to nearby marinas and mooring facilities. 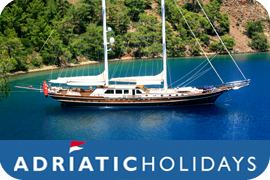 For the ultimate island-hopping experience, we can also individually arrange charters for luxury yachts, sailing boats, gullets, motorboats and RIBS, including skipper and maid hire.